I have gotten behind on my blogging. I am working on some new things and my posts have taken a backseat. Today, I am thankful for my Thankful Thursday post. I always enjoy writing about these whether I am sharing a new piece of jewelry or new charms. I often get inspiration of something in particular to write about and I love those posts. I have two new charms to share. One is from one of my favorite traditional hymns. The song, "This Is My Story," is a wonderful song. Everyone has a story to tell and everyone has his/her own walk with the Lord. We like sharing testimonies and our stories because we know we aren't alone. We all have problems and struggles in life and it helps to know we are all the same in that way. Some walks are harder than others, but they are still struggles. Sharing how we come through on the other side of hard times is what makes us human and inspiring to others. I have always believed we go through certain things for a reason even if we don't understand them at the time. Sometimes, those experiences bring new relationships with people we might not have otherwise known or they steer us in a direction we might not have seen in our path before. I really believe, good or bad, every single part of our day is from God, directed by God, and if we allow it, a gift from God. It's a strange thought, but I have often wondered if when we get to Heaven we see a movie of our life and little things we didn't understand are explained. Things like why we missed our plane, took a wrong turn on the road, or even called a person who had just been on our mind. Our life IS our story. This is the new charm with three small charms trailing behind with the lyrics to the song. Praising, My Savior, All The Day Long, are words I know I need to be reminded of daily. We should praise him not just daily, but all the day long because he knows why our day is going like it is. We just need to trust. This next charm is Fall themed. It is two things I absolutely love. A big Harvest Moon and a church steeple. 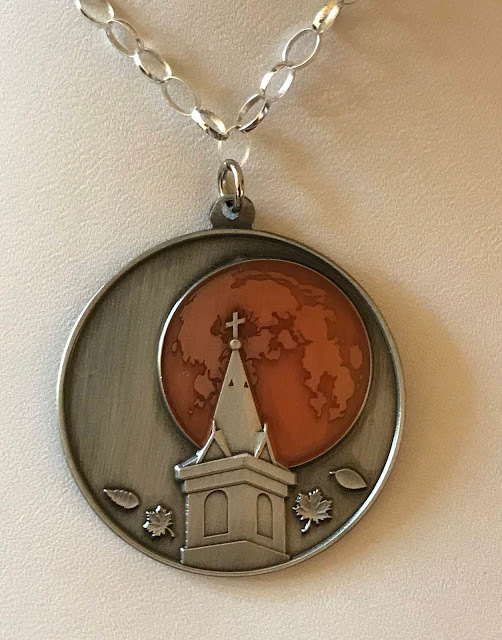 My idea for this was a steeple with the big orange moon in the background. There is something out there much bigger than us and we get to see it in beautiful forms all during the month and at different times of the year. It is also symbolic in faith because the glow of the moon is because its surface reflects light from the sun. Even though it is very bright at times, it only reflects about 12% of the sun. It is a cold dark place without the sunlight. It's kind of like us. Without the "Son" we have no light. We are just a cold, dark, empty mass. We reflect God's love and light by how we live and interact with others. Our "light" shines even more brightly when we share our stories and testimony. These two charms are no different from the others in that they are inspired by my family and faith. I have so many great memories singing the song, "This Is My Story," and I have so many memories of this time of year and Thanksgiving. I am going to be listing both of these soon and I will share all the things I have been working on very soon! Have a blessed Thankful Thursday and let your light shine through your personal story!